Update (8.23.17, 2 hours later): Thank you for all the wonderful name suggestions! I got some really great ideas, such as Dalton, Denver, Desmond, Drew, and Dakota. This has been a tough decision, but quite a few of crocheters across social media (I'm looking at you, Facebook groups!) have agreed that this deer looks like a "Dawson". I find it quite fitting, so Dawson it is! Thanks for all your help, folks! I am in need of some help for naming my newest Twee Toy, a woodland deer. You may have noticed that my animal dolls have alliterating names, for example: Remi the Rabbit, Fletcher the Fox, Brennan the Bear, and Ginger the Giraffe. Thus, I'd like to come up with a name that begins with 'D' for this little deer! So far, I have a several names that I'm quite fond of: Dawson, Dempsey, and Darcy. Would you be so kind as to share some input about these names, or suggest some other names that begin with 'D'? Any and all suggestions, input, and comments are welcome!! Thank you so much in advance, friends! if i could think of another i would saw Dawn, Dessa, Dustin, Devon, Duster, Donner (love this one cause its one of santas!) , Dover, Denton, Dockson, (started making some up haha) but if i picked on of your ideas i would chose Dawson! Wow, you are full of ideas!! I like a lot of those that you've mentioned! Awwww! HE is SOOOO cute! Can't wait for the pattern to be available! What about Dexter? Or Devereux? Dalton? Drew? Daniel? Dashwood? Dante? Damante? 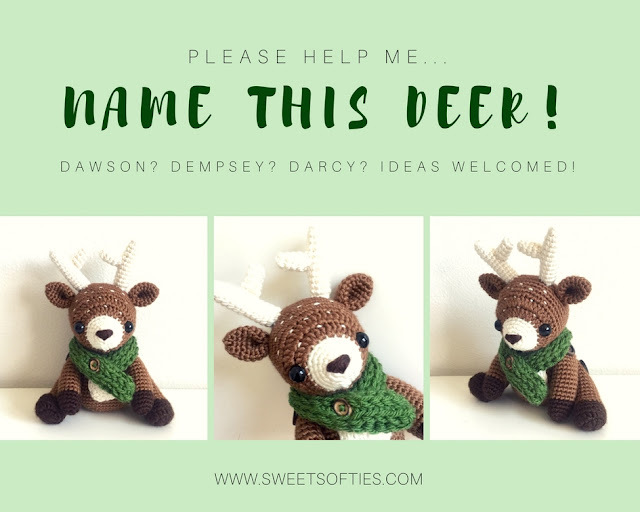 Who knew it was so difficult to name such a sweet little deer?!! LOL! You are so sweet; thanks for your kind words! Haha, I absolutely agree -- naming this little guy is TOUGH! I love your name suggestions! I was really leaning towards Dalton (what a handsome name! ), but ended up deciding on Dawson! Since it's a male with horns I would go with a boy name. I really am feeling Dawson for this creation. Dawson also fits with your other character names. Go luck and absolutely amazing job! Thanks for liking him too! Great names! Desmond and Darby are especially cute! Dewey is a cute name. How unique! I love that. Deklan has a lovely ring to it too! Donovan is a cute name! These are super cute, thanks for the suggestions! douglas. I think he looks like a douglas.